As a literature-based homeschool, I am always interested in programs that utilize real books over textbooks. 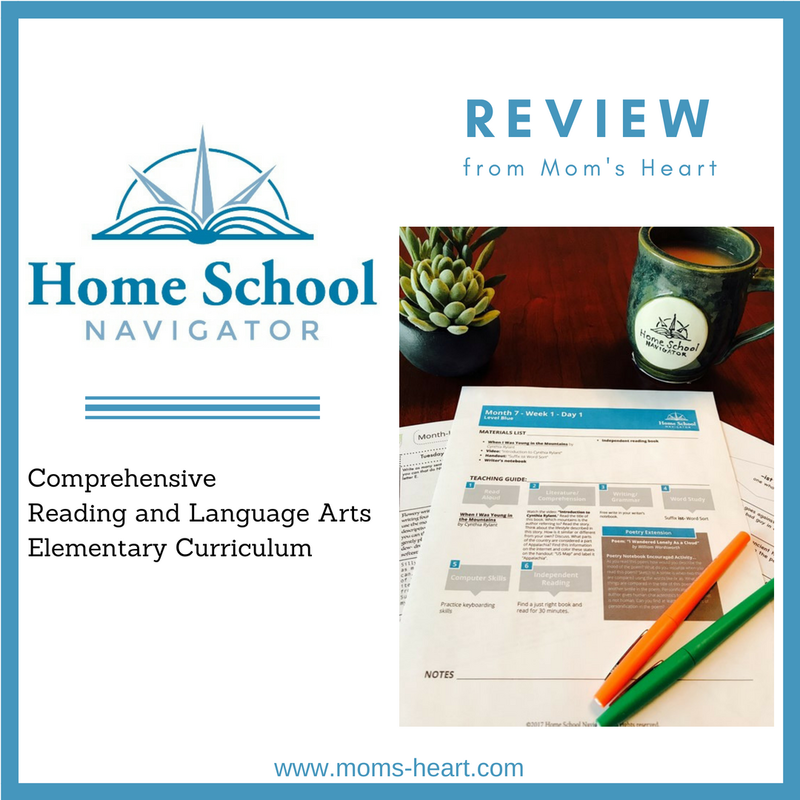 Home School Navigator Reading and Language Arts Curriculum from Home School Navigator is one of those programs, and I recently had the opportunity to review it. Created by two teachers turned homeschoolers, this is a comprehensive language arts curriculum for elementary students. A one year membership to Home School Navigator gives you 36 weeks of language arts, covering multiple strands of language arts--literature, writing, grammar, word study and more. 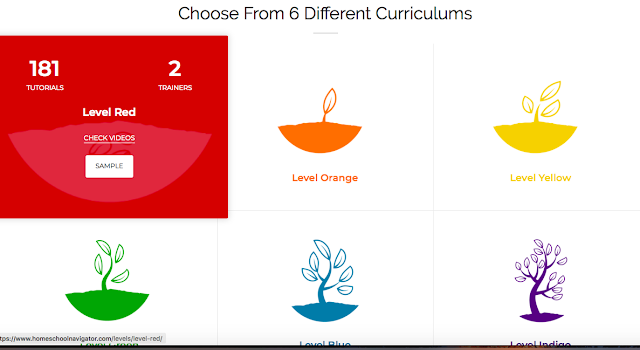 There are six elementary levels, which are color-coded following the rainbow, and each level corresponds to an approximate grade level. The first thing I noticed is that there was no placement test. Instead, we received access to every level, so I could explore and get a feel for the program and how it progresses, and find the best placement for my child's needs. After several weeks, I was asked to "lock in" to a level, so there was plenty of time to determine which level would be most appropriate. Eleanor is precocious, but barely five years old and not officially in Kindergarten yet. She was kind of all over the place when I looked at both Red and Orange, but I placed her in Red/Kindergarten, because that is her upcoming grade level and because I am a firm believer in taking things slow and not doing too much in the way of formal lessons before six years old. I felt like a lower level would be less intense and more easily fit with our style of homeschooling. There was an introduction video to get started, and the instructional guides can be downloaded as PDF and printed. My first thought when really diving in was that there is a lot of stuff to go through, but I think that is because they break it down by month, week and then day. They do offer the printable guides and handouts, so if you have access to the physical books, you can actually do quite a bit of the work offline. If you're a conservative printer, you can still access everything through the website, and just pick and choose which activities to print. Some could certainly be done orally without issue. I liked to look at the daily guide, because otherwise the breakdown on the website is cumbersome to navigate. You must click 1.1.1 for Month 1 Week 1 Day 1, and then that is divided by individual activities. I would prefer it just listed out more traditionally by week, but that could certainly be personal preference. Unfortunately there was no easy back button for most of the review period, which may have contributed to my feelings, and though I've noticed some updates with navigation, I still do not find it the most user friendly. I'm going to break down a typical day - Month 2, Week 1, Day 1, to give you a feel for how Red works. This is what we find as we expand each of the categories above. Literature/Comprehension - We are instructed to read the book (or watch it read aloud on video), and complete a few basic tasks such as finding the Title, Author and Illustrator, and making a prediction. Then there is a video on finding the character in a story. Writing/Grammar - At this level, children are encouraged to draw or "write" an entry in their notebook, and they can use any letters or words they know. Word Study/Vocabulary - On this day we are asked to read our Alphabet Linking Chart from left to right, top to bottom. How Books and Print Work - There is a handout for writing (or tracing) their name, and the words mom and dad are included as well! Independent Reading - Read a "just right" book. Nursery Rhyme Extension - There is a handout for Row, Row, Row Your Boat. The Red level starts out relatively easy and age-appropriate. Essentially we read a book each day, with a couple of books scheduled each week, and retell the story in different ways. Sometimes we're sequencing (like below), or there are activities for retelling the story with puppets, visualizing what was read and sketching scenes, or retelling a few facts recalled. All of these are essentially a type of narration. As a Charlotte Mason homeschooler, I don't put much emphasis on formal lessons before age six, but as most Kindergarteners are or turn six during the year, these are still excellent activities to include in a Kindergarten level program because they develop the habit of attention and early narration skills. We found the activities low-key and easy to implement. The phonics activities are things like scavenger hunts, matching and memory type activities. These are simple and engaging, and don't require much effort on my part or hers. I also love the inclusion of nursery rhymes, because I already use a favorite nursery rhyme book for Kindergarten due to the literary benefits of nursery rhymes and word play. Children are not truly expected to be reading or writing - they can even "write" their letters in shaving cream or other sensory materials if needed! The activities are short, though as you get further into the program, I noticed the comprehension activities become more formal and structured, with charts and graphs requesting more specific information. I don't think this program is particularly strenuous at this level, and it's mostly fun for Eleanor, but it did look like it becomes less compatible with our Charlotte Mason style as you move into higher levels. So far, though, I've liked the book choices. The first couple of months have used books from the popular "If You Give a . . . " series, and Eric Carle books, among others. The book choices later in the program that I'm familiar with seem decent, though I can't speak for the literary quality of all of the books. This program was developed by real moms who really homeschool, and you can tell they've put a lot of work into developing a program that works well for both parent and student. The instructional videos sprinkled throughout are great for parents who don't know how to explain a concept, because children can just watch along. They also acknowledge that they include a lot of activities. They suggest that parents are free to skip things that are too easy or adapt the program in the way that makes it work best for their family. I decided that we didn't need the Writer's Notebook at this stage. Eleanor is always drawing pictures and labeling them or writing little books all the time in her free time, so we could skip it here and free up time for the other activities. They also have built in review days, which work well for make-up or catch-up days. This also builds in a little cushion for families who need to adapt the five day schedule to a four day school week. I found the website a little awkward to navigate, and though the program isn't going to be a good fit for us long term, I do think it is very well put together and would still recommend it to others. It looks like a great program for the parent who wants a checklist of items to complete and wants to cover as much as possible with one program. I appreciate that it uses real literature, and includes a variety of activities to meet the learning styles of different students. You can even upload your work into a portfolio for record keeping purposes! Homeschool Navigator offers a comprehensive, traditional language arts program in a modern format. 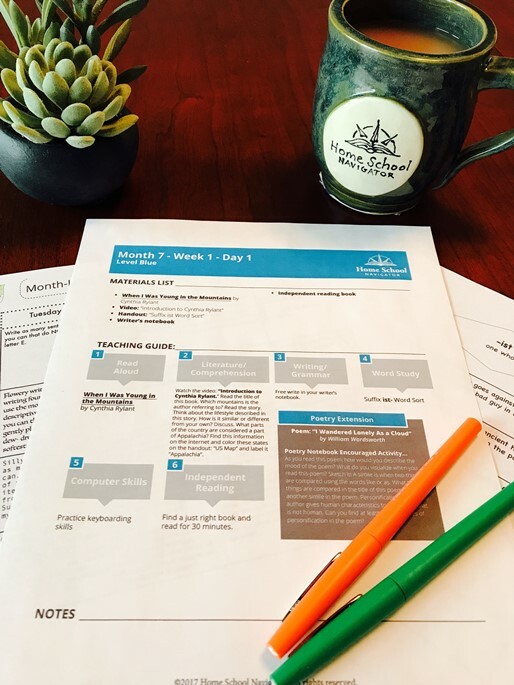 The Homeschool Review Crew has reviewed all levels, and many of the families with older students are reviewing the interactive notebooks, so hop on over and read their reviews!